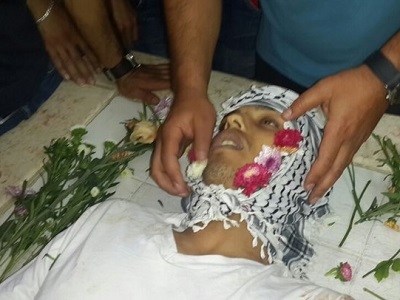 Muhammad Abu Latifa was 'executed' during an arrest raid in the Qalandiya. Palestinian teenager Muhammad Abu Latifa was “executed” during an arrest raid in the Qalandiya refugee camp on Monday, his family said, refuting claims that he fell from a rooftop while being chased by Israeli forces. Locals said that Israeli military vehicles raided the camp early Monday and broke into the home of Muhammad Abu Latifa, 18, in an attempt to detain him. Israeli border police said they opened fire at the teenager as he attempted to run away, hitting him in the lower body. They claimed Abu Latifa fell to his death while he was running away across rooftops in the camp. However, Muhammad’s uncle, Jamal Abu Latifa, refuted the police statement, saying that Israeli soldiers detained Muhammad after shooting him in the feet. “He was chased at 5:30 a.m., shot in the feet then arrested alive. Surprisingly, the Israeli soldiers shot him in the chest, then tied him with electricity wires and we have evidence that some of his body parts were fractured as a result of the assault by soldiers,” he told Ma’an. Jamal Abu Latifa, an official in a local camp committee, added that Muhammad did not fall from a rooftop and was not wanted by Israel for any reason. Abu Latifa is the 18th Palestinian killed by Israeli forces this year and the fourth this month. 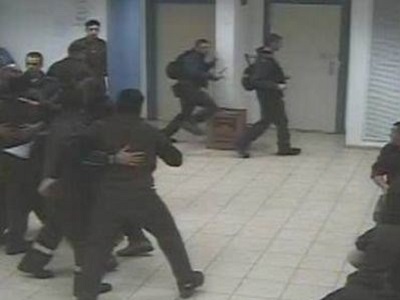 On Thursday, Israeli forces shot dead Falah Hammad Abu Maria, 53, in the southern West Bank while arresting his son. A day earlier, Israeli forces shot and killed Muhammad Ahmad Alawneh, 21, in Jenin. Earlier this month, another teenage resident of Qalandiya refugee camp, Muhammad Hani al-Kasbah,17, was shot dead by an Israeli commander after throwing a stone at an Israeli military vehicle. The Israeli commander claimed his life was in danger, although video footage later confirmed witness reports that Kasbah was running away from the soldier when he was shot dead. I am from Vancouver,Canada and I wanted to say that Palestinians are been killed by the apartheid Israeli gov’t and the Canadian gov’t is complicit in these killings because of its support for the Israeli gov’t. Israel needs to be brought before the ICC in the Hague as soon as possible and be charged with war crimes and genocide against the Palestinian People.These executions of Palestinian People has been going on for decades and its time the ICC done something about it. The majority of people in the world supports the Palestinian People in their fight against Israeli apartheid.This has been proved by the many freedom Flotilla Boats that have gone to Gaza in recent years.